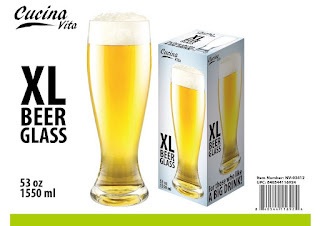 When you're extra thirsty, reach for this XL Over Sized XL Beer Glass. This tall glass holds up to 1.5 liters of beer, soda, or another beverage. I was excited to get this Cucina Vita XL Beer Glass. They are not kidding when they say XL because this glass holds 53 oz (1550 ml) For as big as the glass is, it is not difficult to hold and I think it is lighter than it looks as well. I love the shape of this beer glass, it works great with a cold beer. I love that it holds 1.5 liters and you can use any beverage you want to drink. I think it would make a nice gift for the beer drinker in your life. I also think these XL Beer Glasses make a wonderful addition to your glass collection or to a home bar. I recommend it!